NwaVic: From the Ugandan Slums to a Chess Game with Bill Gates: The Inspirational Story of Phiona Mutesi. From the Ugandan Slums to a Chess Game with Bill Gates: The Inspirational Story of Phiona Mutesi. I came across this story today on the Huffington Post and was so inspired. It's about 17-year old Ugandan chess player, Phiona Mutesi who has now been challenged to a game of chess by Bill Gates. Having lost her dad to AIDS and her sister to an unknown disease at an early age, Mutesi grew up in the Ugandan slum of Katwe, dropping out of school at nine years old because her family could no longer afford her school fees. Mutesi discovered and learned the game of chess by attending the Sports Outreach Institute while she spent time at Ugandan missionary in 2005. Five years later, she played in the 39th Chess Olympiad and by 2011,she earned the position of three-time Women's Junior Champion of Uganda. In just 8 years, Mutesi has gone from homeless to an internationally recognized chess player, having won title for Woman Candidate Master at the 40th Chess Olympiad at 16 years old, alongside Ivy Amoko. The title made both players the first female players in Ugandan chess history. Shortly after, Mutesi became the first female player to win the open category of the National Junior Chess Championship in Uganda. She is also the youngest person to win the African chess championship. 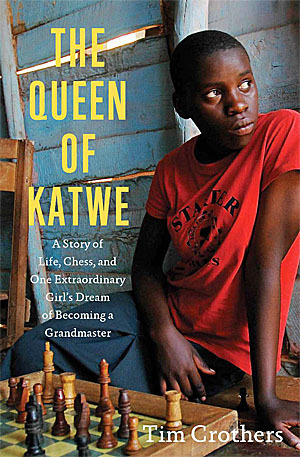 Recently, a book was published in her honor "The Queen of Katwe: A Story of Life, Chess, and One Extraordinary Girl’s Dream of Becoming a Grandmaster". Disney now has rights to the book and there's a movie in the works based on it. Mutesi's story is so inspiring, she has caught the attention of Bill Gates who has challenged her to a game. There's no official set date for the match between Mutesi and Gates but word is that it'll be part of a continued promotional book tour. Her story has been featured on CNN, Huffington Post, a YouTube video, Yahoo news and several other news outlets. She even has her own Wikipedia page. Go Girl! Inspired yet? I know I am. Stories like this show you and I that we can achieve anything we want if we believe and continuously work hard at it. Like many Nigerians say, no condition is permanent. Whatever you want to be, you CAN be.